I am majorly a Pinterest addict. I do try and get useful things off the site and not just drool worthy evening gowns I will never own or funny memes. Lately, I have been on a kick about trying cleaning tricks I have found on there. Even better if the involve cleaning products I have already in the house! These two are both fairly easy/quick tricks so I decided to lump them into one big ol’ review. Any girl who owns makeup brushes know that are a pain to clean. There are so many “ultimate” cleaners and gadgets out there it gets down right intimidating! Not to mention the horror warnings about making sure you don’t get the ferrule wet and ruin your (potentially) expensive brushes. 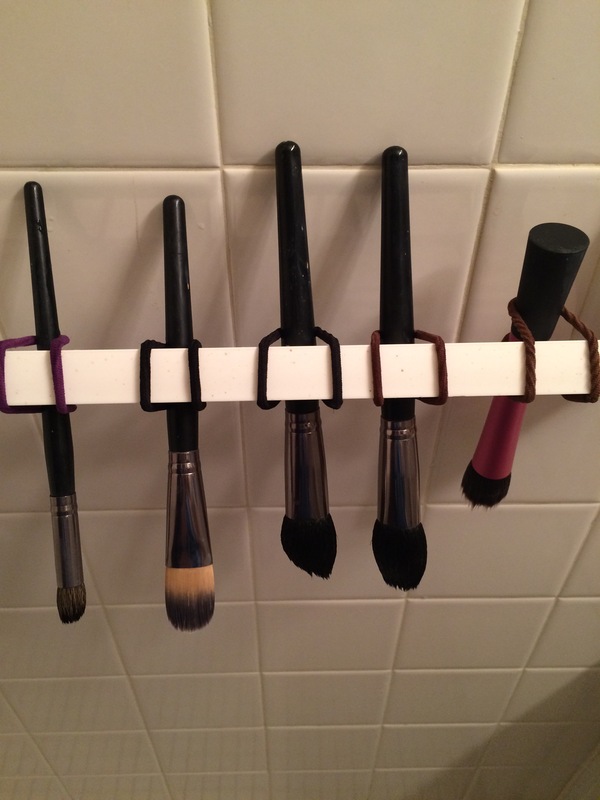 Well I found one simply amazing way to dry your brushes, avoids the whole risk of misshapen brushes too! You use hair ties and your towel rack, what girl doesn’t have those? Two spoons up on this one! I adore my Pyrex. I love that I can store in the same container I cooked in. Plus those suckers last forever, unless you drop it accidentally. But who hasn’t gotten annoyed at that greasy buildup that is a nightmare if you don’t see it right away? Well one pin said to use a Magic Eraser and the buildup would come right off! Yeah, I am going to have to fail this idea. The buildup did come off, but no better than just using a little old fashioned elbow grease and baking soda. So don’t waste your time or money in Magic Erasers on this chore, baking soda is way cheaper.